A showdown looms between Spanish authorities and the prosperous northeastern region of Catalonia over a planned October 1 referendum on independence. While some residents of the linguistically and culturally distinctive region have long pushed for secession, the current impasse has its roots in 2010, when a constitutional court overturned an agreement granting the region a degree of autonomy while the central government imposed austerity measures amid economic crisis, says Pablo Beramendi, a political scientist at Duke University. Why is Catalonia’s push for a referendum driving such a fierce confrontation with national authorities? The Spanish government is attempting to prevent the referendum at all costs. Its position is that the Catalan government is engaging in illegal activities—an assault on the constitutional status quo—and so there is nothing to negotiate. But they are operating in a legal backroom, suspending [the region’s] autonomy and basic political and civic rights [without following] procedures established by the constitution. Supporters of the referendum, in contrast, argue that they are challenging the constitution, saying, Madrid gave us no other option to facilitate the mandate we have from the Catalan people. They also argue that some of their actions are not illegal under a more flexible interpretation of the norms. Moreover, diehard supporters of Catalan independence would say this is [another] chapter of aggression by the Spanish state against Catalan autonomy: they rob us, they suppress us, they exploit us, and it’s time to break the chains. The contrast between these two discourses reflects the unprecedented degree of polarization this process is causing. Does this dispute have roots in Spain’s transition to democracy? The constitution [of 1978] granted more political autonomy to some communities and regions. However, it does not recognize any sovereignty but that of the Spanish nation. There is no constitutional recognition of a plurinational state. How have the Spanish and Catalan governments managed this in the past? Between the early 1980s and the early 2000s, Catalan [political] parties would typically demand additional powers from Madrid, especially during periods in which they were necessary for coalition building in the national parliament. Through this mechanism they extracted concessions in terms of [autonomy over spending]. But by the early 2000s, the institutional room for additional accommodations within the common system was reaching a limit. The Catalan government demanded a reform of [the law governing its autonomy,] the Estatuto de Autonomia, to approximate those of the Basque Country and Navarre. This demand also covered political and symbolic aspects, including, among others, the recognition of Catalonia as a nation and the status of Catalan as the primary language for public administration in Catalonia. In 2004, the government of [Jose Luis Rodriguez] Zapatero needed the support of left-wing Catalan parties to support its initiatives in Madrid’s parliament, as did the Catalan Socialists in Barcelona. He granted the Catalan government room to redesign the contract, and even pleaded publicly, I’ll accept the reform as approved by Catalonia’s parliament, a commitment he reneged on afterward. That process yielded the 2006 Estatut, which was negotiated in the Catalan parliament, then watered down significantly in the national parliament, and approved by both parliaments and in a referendum in Catalonia, with 50 percent participation and 74 percent approval. The law introduced several innovations in the contract, but three were key: There was stronger symbolic recognition of the identity of Catalonia along the lines mentioned above. It gave more room for political autonomy. And it introduced some reforms in the fiscal arrangements between Barcelona and Madrid. That was when the Spanish economy was booming, with the housing bubble at its peak. The conservative Partido Popular, which is now in office in Madrid, mobilized its core by challenging the Estatut in the Spanish Supreme Court. Rallying around the flag against the reform was part of their mobilization and electoral strategy. In 2010, the court struck down fourteen articles bearing on symbolic recognition of Catalan identity, fiscal arrangements, and policy autonomy. While the number of articles may seem low, the ruling removed most of the progress achieved relative to the status quo. The middle ground for a new contract between Madrid and Barcelona essentially vanished. The middle ground for a new contract between Madrid and Barcelona essentially vanished, which in turn triggered a fundamental change in Catalan society and in the dynamics of party competition within Catalonia. Up until that point, Catalan support for independence and demand for a referendum had been around 20 to 25 percent. A lot of people who saw the right of Catalans to decide their future as too radical a demand perceived that the alternative, negotiations with Spanish authorities, was no longer available. This is when a major switch toward support for a more radical renegotiation of the contract with Spain began to take place —not necessarily independence, but certainly the right to vote over the future of Catalonia. By 2010–2011 economic circumstances had also changed. Spain was in the midst of a major economic crisis and Madrid was forcing the Catalan government to implement draconian caps on education and health, especially after the conservative victory in November 2011, while accusing them of mismanagement. [The Catalan government was already] complaining it was contributing too much to the rest of the federation. In response, political competition led Catalan nationalists to demand a fiscal arrangement similar to that at work in the Basque Country and Navarre. Madrid’s refusal to entertain negotiations led to a new Catalan election in 2012, in which the winning party demanded the “right to decide.” After much back and forth, a popular consultation took place, though it wasn’t presented as a referendum proper. Several of the leaders who helped organize this consultation underwent prosecution. [Former Catalan President] Artur Mas was eventually convicted, among others. In 2015, a new election was called, and the dynamics of polarization led [the left-leaning, Catalan nationalist parties] ERC and CUP to support a leader for the coalition Junts pel Si with clearer pro-independence leanings. That’s why the president since 2015 has been Carles Puigdemont. In the meantime, a major realignment of the Catalan party system took place between 2010 and 2015. The current government represents a coalition of left- and right-wing nationalist parties in favor of the referendum and independence. This coalition won a majority on a platform with an explicit hoja de ruta (road map) toward independence. Postelectoral bargains with CUP introduced the referendum at the center of the political agenda. The Catalan government’s intention to implement it, and the refusal of Madrid to even consider negotiating about it, explains the absence of middle ground. Support for the referendum and support for independence are not the same thing, but . . . they are becoming entangled. Catalonia is a divided society. 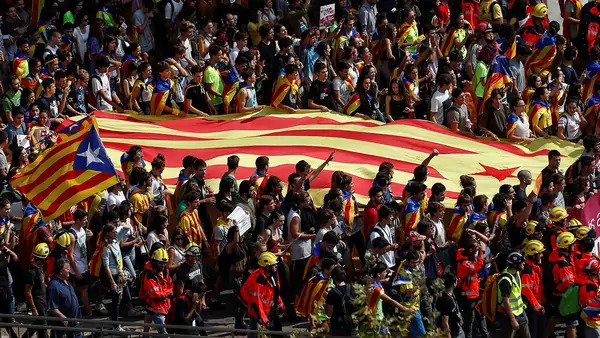 Support for independence is between 40 and 50 percent, but support for the right to decide in a referendum agreed to by Madrid and Barcelona is well over 80 percent, as recently reported by El Pais. Support for the referendum and support for independence are not the same thing, but because of Madrid’s unwillingness to act politically on these questions, they are becoming entangled, feeding back into the current spiral of polarization. Unlike Catalonia’s leadership, Barcelona’s mayor, Ada Colau, doesn’t support independence, but seems to have been pushed to support holding a referendum. Ada Colau is a clear example of an ambivalent Catalan. A lot of her voters support independence. She supports the ability of the Catalan people to choose, but she is not supportive of the direct confrontation that the Catalan government has triggered with Madrid. In any polarization process, intermediate positions become hard to sustain. After initial ambivalence, the repressive reaction by the government of Madrid is pushing Ada Colau and her party closer to the Catalan government. One of the consequences [of Madrid’s actions] is that there might be much stronger support for a clean break with Spain and less room for a negotiated agreement on which most parties can agree. Paradoxically, the more the Spanish government flexes its repressive muscles, those supporting the referendum and an eventual break with Spain may actually get closer to their medium-run political objectives. Does Rajoy fear that any concessions might be the start of a slippery slope? Rajoy is a diehard Spanish nationalist. Self-servingly, he interprets the process as a legal matter. His position is that all democratic parties have to be with him, almost as if Spain were again fighting [the Basque terrorist group] ETA. In my view, he and his party are confusing the nature of the challenge. This is not a disheveled mass of people trying to break protocol or procedure. This is a political community asking for a redrafting of its contract with the rest of the state, and the strategy that worked against ETA and its supporters is bound to fail in this case. It would have been far less costly, far more acceptable from a democratic standpoint, and far more effective never to have challenged the Estatut in 2006, and instead open the door to mutually agreed reform that would include a referendum with clear procedures and implications. At this point, however, this is not something Spanish conservatives (or most socialists, for that matter) are remotely willing to entertain. Both in 2006 and now, their unwillingness to negotiate is driven by ideological and, more importantly perhaps, myopic electoral considerations. If the “yes” vote prevails, what would be the way forward for Catalonia in the European Union? A threat that Spain holds against the Catalan government is, if you leave us you will be out of the EU. Catalonia would have to reapply for membership, and its transaction costs would go up, especially because Spain would have a veto. That is a huge bargaining chip. But, on the other hand, the creation of a common market and monetary area makes redrawing boundaries less economically costly if both parties have goodwill; an autarkic Catalonia would be to no one’s benefit, Madrid included. Given a hypothetically independent Catalonia, the transition period could adopt many forms, as we are seeing with Brexit. It could be made costly; that would be the position of people who would like to set an example for those who want to break up their own state. Or it could preserve economic relations, which would probably be in the interest of all parties involved. What type of strategy would ultimately be adopted would be driven by the process. There is a long way ahead, and little reason to be optimistic.